Absent some real medical need, many natural parents don’t strive for a hospital birth. Natural childbirth is so often embraced as part of the natural parenting experience, and few things feel as unnatural as laboring and birthing in a strange, brightly lit place under the scrutiny of a team of medical professionals that you have little to no relationship with. That’s why I almost feel like a natural parenting blasphemer when I confess that I truly enjoyed my hospital birth experience. I credit that experience to having a wonderful hospital with excellent policies, including respect for a woman’s ability to birth her child. I will be the first to admit that I had a very special hospital birth experience. Even though labor was induced, I never felt pressured. I was never told that my labor wasn’t progressing fast enough. I wasn’t pressured to stay in bed. I wasn’t given a timeline or told that my body wasn’t working properly. I was simply given the opportunity to let my body do its work. I was encouraged to walk around, labor in the jacuzzi tub, stand, sit, or do whatever was comfortable for me. I was given free reign of a television with DVD player, CD player, and I had my laptop with wireless Internet connection to keep me distracted in early labor. No one tethered me to my bed or even tried to keep me in my room. And my room? It was amazing. I gave birth in a large, private room that we remained in for our entire stay. We had control of the lighting, the temperature and the sound. I did get an epidural, but it was at my own request, and I never felt pressured to request it. I was advised that it was available, and then the ball was in my court. The hospital and its staff gave me all the right things to make my birth experience truly my birth experience. The birth itself was wonderful. My regular doctor was off (it was Christmas eve, after all) but another, wonderful doctor was there for the delivery. Immediately when he was born, my son was laid on my chest so we could bond. There was no whisking him away to be weighed out of my view. There was no separation. Even during the few moments that his vital stats were taken, they were done mere feet from me under his daddy’s watchful eye, and they were done only when I was ready to let him leave my arms for a moment. Most encouragingly, the doctors and nurses assumed that I would be breastfeeding. There was no mention made of formula or bottles. Instead, lactation consultants were sent to my room three times during our brief hospital stay (and were available on-call at all other times). I was given literature on breastfeeding, I was told how I could reach the lactation consultants after we were sent home, and I was encouraged to participate in the wonderful breastfeeding mothers group that met at the hospital under the guidance of a lactation consultant. I was given all the right tools for the job. I realize that my hospital birth experience is relatively unique (all birth experiences are unique though, aren’t they? ), but I fully believe that my experience is just as legitimate and just as amazing as a birth experience that takes place in the home, or with a midwife, or at a birthing center. When the principles of natural parenting can work in harmony with the hospital birth experience, the outcome can be just as rewarding. Unfortunately, the birthing experience does not come with a guarantee. I could have just as easily ended up with a nurse whose personality conflicted with mine, or an on-call doctor who wanted to pressure me to progress at a rate my body wasn’t prepared for. While I could never anticipate every possible issue, there were a number of things that I did to check out the hospital beforehand to ensure that it met my expectations and meshed with my values. First, I took a childbirth class sponsored by the hospital. That gave me some exposure to the hospital itself by allowing me to spend some time there, and by meeting the nurses who taught the class I was able to gauge their approaches to birth. Second, I asked questions about breastfeeding from early on, and I liked the answers I received about the resources that the hospital had available. Google was my friend, and I used it to the fullest to read other moms’ reviews of the hospital and their experiences there. In all, it all came together to be a wonderful, fulfilling birth experience. Hospitals now are open to allowing women more feeedom to birth their children how they like to. With my kids, I was to given a lot more freedom and choice than one would expect. I to enjoyed my experience in the hospital as well. I was given a lot of choices and even allowed to go home the next day. Thanks for sharing, Jenn! I think NP’s can forget that a great birthing experience can happen anywhere! I’m glad your experience was wonderful! Great article! I have had four hospital births and all of them were awesome, in their own way. Any medical intervention was done only when there was a need. IN fact, I was so thrilled with my nurses when my third child was born that I requested the same nurses for the birth of my fourth! I have two children; the first was a section thanks to pre-eclampsia, but everything about it was disappointing – my doctor had no bedside manner and no one was interested in my opinion concerning anything. For the second, I searched until I finally found a midwife – who, because I had pre-eclampsia last time, wanted me to have an OB as well. We didn’t have much in common, but she was constantly cancelling appointments with me because she had so many mothers, so I didn’t even get to spend much time with her and didn’t notice how poorly we truly get along during that time. I saw the OB regularly in the meantime. When the time came, I called her in – and immediately regretted it. She drove me insane. She was pushy, annoying and just plain strange. In reference to me, she told my mother, “She knows what she wants, doesn’t she?” She brought an assistant with no experience who took my blood pressure and made so many mistakes that my midwife thought my BP was so high she wanted me rushed to the hospital. I was glad for the excuse and as soon as we got there, I asked her to leave. The hospital that I thought would be working against me like last time? It was heaven. They let me do whatever I needed to and didn’t bother me. They basically left me alone until I requested something. I was in labor for 33 hours but no one tried to push me into a C-section (although they wanted to discuss it eventually, considering my water broke 26 hours prior to that conversation and they were worried about infection). I never dreamed the midwife I thought would be on my side would just bother me constantly with weird requests, while the hospital provided everything I needed with no pressure. Sounds a lot like my hospital experience. 🙂 If only they could all be that way! (From what I’ve heard, a lot of hospital births are terrible and even traumatizing.) Any regrets I do have about my birth have to do with my own choices and preparedness, which is easier to live with and makes me feel empowered to have an even better go of it next time. Thanks for sharing! It’s great to hear about good hospital births and not just the horror stories. I had four hospital births, in three different hospitals, ironically under three different major Healthcare umbrellas and all of my experiences were like that. They really push the breast feeding thing now, and ironically they were over 13 years ago when I had my son, so I wasn’t even given the option of formula feeding. My only complaint was the breast feeding coaches. I felt they were quite pushy, especially with my last three. I knew how to breastfeed, so I didn’t always appreciate the multiple intrusions to make sure I knew how to feed my child. However, that is done by the breastfeeding league not the hospital. Each of my rooms had a jacuzzi tub for comfort, my own thermostat,and all you had to do was ask for snacks and drinks (after baby was born of course) As for the epidural, they don’t even mention it unless you ask for help with the pain. I know a lot of people have great home births, but I had two babies born in distress due to different complications that popped up during delivery and I was glad to be at hospitals with a neonatal unit prepared to help and handle any situation. I think it can be (obviously not always) a good experience. Thank you for sharing, Jenn! My second labor and delivery was in the hospital, which (as you may know) I DREADED — but it all turned out to be fine. I can credit two factors in how it worked out as it did: I had a short, clear, carefully thought out birth plan that my midwife probably knew by heart by then, and we lucked out with a TOTALLY AWESOME L&D nurse. All the stuff I thought I might have to fight for just happened without my having to say anything at all — the midwife and nurse made it all happen. What I *didn’t* like was the stay in the hospital afterward. One of the biggest reasons I didn’t want to give birth in the hospital was that I didn’t want to be separated from my baby. Even with 24-hour rooming-in, my baby was in the nursery far, far more than I wanted. The hospital is actually moving toward less mother-and-baby separation in its policies, but very, very slowly. Making that move is really a big change to the culture of the hospital, so I guess I get that. I would have preferred to leave much earlier than we did! But alas, we couldn’t leave until my baby had a few tests done (related to the condition that was the reason why I gave birth in the hospital in the first place). I had heard about babies being taken away to nurseries, so that was one of the first questions I had about our hospital. They did have a nursery and would take the baby there upon request if mom needed a little break but other than that, it was expected that the baby would room in with mom throughout their stay. As I think about it, I think that’s really something that makes the difference between good hospital births and bad: the expectations of everyone involved. If the hospital and its staff expect mom to succeed on her own, I think there’s a greater chance that she will. If they expect that mom needs the help and intervention of doctors and nurses, they treat her like a patient with a condition rather than a capable woman. Thank you so much for your story. Reading it was like reading my own story. (The difference was I had a midwife who was on “vacation” and so an OB delivered). It truly bothers me that so many people have this misconception that all hospital births involve forced interventions. Personally, I think the horror stories are the minority, and if some honest statistics were done we’d see that most women have a very positive view of their hospital births. I love this post! 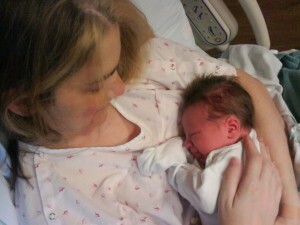 I had two very wonderful Natural Birth experiences in a hospital. The hospital I delivered at is WHO certified Baby Friendly though. Everyone is attended by a midwife unless they are high risk or needing a c-section (the rate of which is quite low). My second natural birth was twins and I was induced at 39w4d, but they were very supportive of my desire to not have an epidural. I did have to do the actual pushing in the OR (they had me get in bed and wheeled me down there), but it barely registered. What I remember most is lovely OB tell me I could put my foot on her shoulder (I did) while I was on my side pushing, and the warm and wonderful staff of nurses telling me I was doing amazing. The only person who tried to coach me in my pushing was my husband, and I promptly told him to please shut up! A lovely young nurse got my babies latched on promptly to breastfeed shortly after their birth, and I had so much help from everyone after that. Formula was never suggested or assumed. The hospital and staff have such an impact on a woman’s ability to have a natural, peaceful birthing experience outside her home. Refreshing stance! I’ve had 4 good hospital birth experiences. While I hadn’t realized I had a choice with my first 3, I would have loved a home birth with my 4th. I needed to be close to a NICU, though. It was good thing, since we did wind up needing the NICU services! While I think very few births (at hospitals or otherwise) go exactly as dreamed, I was very happy with my experiences and rarely felt any sort of pressure toward any interventions. I could have written this about my birth experience almost word for word! The only difference for me is I was induced because the baby was presented small, so after her initial assessment and cuddles she had to hear to the NICU for observation, but everything was perfect. They presented me with my options, made recommendations, never pressured about pain relief which i also opted for (but would have been angry if i felt pressured to use it). Oh, and I had a Christmas Day baby, so go figure! The hospital isn’t all bad, i actually looked at switching to a midwife but now I know even if I do a natural birth, I would still do it in the hospital. Beautiful story. I had three hospital births, too, and two of them were lovely experiences (the first wasn’t horrible, but it wasn’t lovely). Hospital births can be beautiful, empowering experiences (and natural ones, if you wish! ), too. Thank you for sharing! What a wonderful experience ! I am so glad to hear someone advocating natural, respectful birth- regardless of location. People seem to forget that when they advocate one type of care over another, they may be just as disrespectful to women’s needs and desires as they presume hospitals to be. We should build our sisters up by making them feel confident intheir choices, not bad about them or “less” as women somehow. Overall I too enjoyed my hospital birth experience, though next time I’m hoping to have a midwife. My daughter was given to me immediately after birth and stayed with me the whole stay, except for her PKU test which we did because it runs on my husband’s side of the family.